Congratulations to Nicholas Boogades and Caroline Wilcox, the winners of this year's Amy Schuerholz Metz and Charm City Run Scholarship. 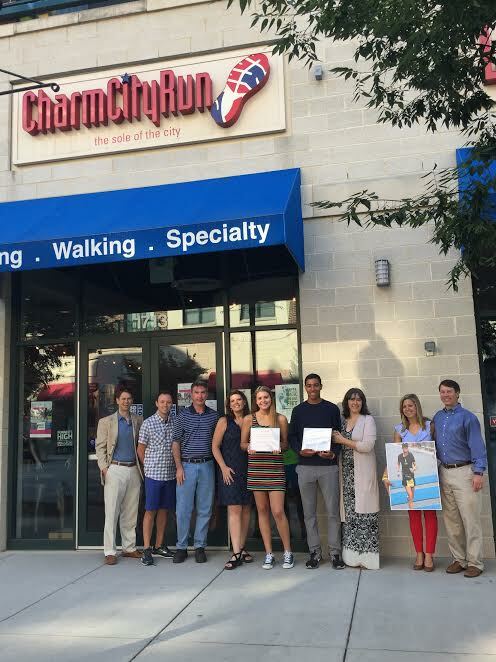 Previously, Charm City Run awarded one graduating male and female high school senior with a $1,000 college scholarship. This year, we are excited to partner with Amy Schuerholz Metz's family who matched our scholarship to award each winner with $2,000. Nick and Caroline embody both Amy's love of running and Charm City Run's mission statement: "to inspire and move the human spirit, one sole at a time." We are proud to award them with these scholarships and look forward to seeing the amazing things they accomplish, both on and off the track. Get to know Nick and Caroline by reading our interview with them below. How did you find out about the Amy Schuerholz Metz and Charm City Run Scholarship? What motivated you to apply? Nick: I found out about the scholarship through my high school team. My coach gives all the seniors a hand out about the scholarship at some point during the year. I applied because some of my past teammates have won and they told me how much it helped them. Caroline: My cross country coach mentioned it, and then my mom saw the article in the paper. When I learned that the scholarship was honoring Amy's memory and her love of running, I knew I had to apply. Running seemed to change her life, and it certainly has changed mine. It was so special to apply, and such an honor to win. Where are you going to school next year? What made you choose this school and join the team there? What do you plan to study? Nick: I'm going to the University of Tennessee, Knoxville next year. I decided to run there after the instant connect I felt with the kids that were currently on the team, along with the coaches and other staff. I will be studying agricultural science. Caroline: I am going to Mount St. Mary's University next year to run cross country and distance for indoor and outdoor track. I chose this school because the team really seems to treat each other like family. It's motivating to be on such a positive team and makes you want to do better not only for yourself but your teammates. I plan to study communications and I'd love to share my journey and story -to help others overcome their struggles and also to find their passion. Nick: I started running indoor season of freshman year, then the next year picked up outdoor, then the following year, cross country. Caroline: I always liked to run, and my field hockey and lacrosse teams used to make fun of me for always being first in the run drills. I decided to try indoor track instead of basketball my junior year, and I never looked back! Running makes me feel strong and healthy. Nick: Running is one of the few things in my life that is consistant and very structured so I like the regularity. Caroline: It means everything to me. It literally changed my life. What is one challenge that you have had to overcome during your high school running career? Nick: A lot of challenges I've experienced have been with relay teams. Constant shuffling of the line ups and guys being out because of injurys have created added levels of difficulty. Caroline: I had played lacrosse since I was four years old, and during my sophomore year I committed to play at Jacksonville University on their Division I team. However, after being a strong contributor on the track teams at Winters Mill, I realized that my passion was truly for running rather than lacrosse. I needed to get the strength to tell my parents and coaches that I had changed my mind. I knew it was something I had to do for myself. I also had overcome an eating disorder in high school, and I used that strength to help me with this decision. I sincerely believe that my love of running helped save my life. What is your proudest running accomplishment to date? Nick: Proudest accomplishment would be indoor team county championship senior year. Caroline: I am so grateful to have been part of a successful team that supported a first time runner. I was surrounded by people who had been running for as long as I played lacrosse! They were so helpful, and I became a scoring contributor to my teams. I finished my first indoor track season in the all-time top 10 finishers for the 1600 and 3200, and I placed in the top 10 for counties, top 16 for regionals and even individually qualified for states my first year in cross country. These are all great achievements, but perhaps the proudest moment was when I was asked to join the Mount St. Mary's team the day after placing 31st in my first state meet. Nick: Running at high profile meets (hopefully). Caroline: Taking my running to the next level and being an impact runner on the team. How do you hope to continue to make a difference in your community? Caroline: I think my story can really help people know that following your heart can overcome any obstacle, even if it seems impossible at the time. My ability to overcome anorexia gave me the strength to stand up for myself and follow my dream of running in college. Importantly, I am motivated to stay healthy and inspire others to show them that overcoming obstacles is part of life, that recovery is possible, and success is achievable. I'd love to be an ambassador for healthy living and following your heart, especially for high school students. To learn more about the Amy Schuerholz Metz & Charm City Run Scholarship, click here.